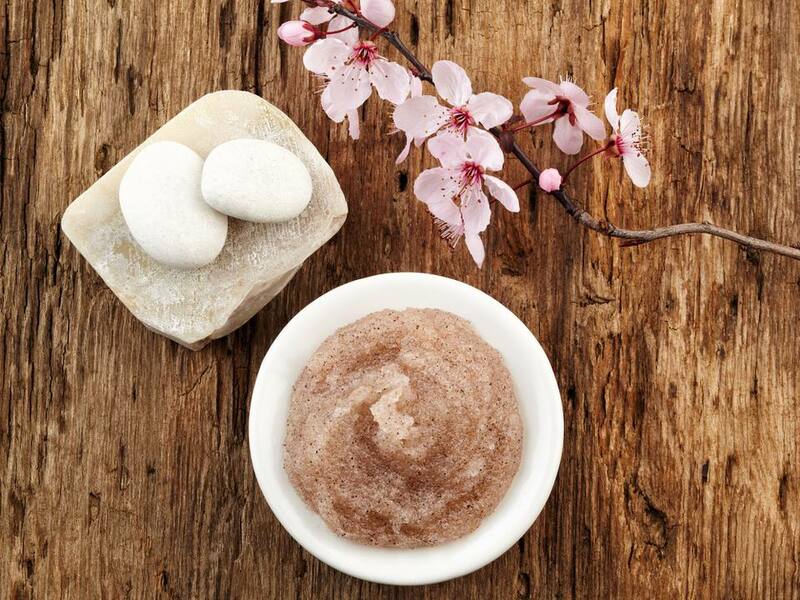 Body scrubs or salt scrubs at the spa are an expensive treatment, but you can give yourself one at home. The purpose of an at-home body scrub is to exfoliate the outermost layers of dead skin cells, revealing softer, younger cells just below. A home body scrub probably won't be as thorough or pampering as a spa treatment, but it still has benefits and is a lot less expensive. You can either buy a nice body scrub, make your own body scrub at home, or use an exfoliating mitt like the kind they use at Korean spas. Soften the skin first by soaking ten to fifteen minutes in a warm tub. Add a relaxing essential oil like lavender, ylang-ylang, or rose-geranium to make it more relaxing. Let the tub drain, and pat yourself dry. Place a towel on the edge of your tub and sit on it. If you're using a body scrub, put a little bit in the palm of your hand and rub it over the skin. Start with your lower legs. Roll up a moist washcloth and rub your skin, spending at least a minute or two in each area. If you go too quickly, you don't get the full exfoliation. Don't scour too hard or too long, especially if you're using an abrasive salt scrub! Stand up when it's time to do your backside. Make sure you have steady footing. The back is the trickiest part. Reach where you can, or ask your partner to help. A body brush with a long handle can get to the spots between your shoulders. When you're done, rinse under the shower. Don't give yourself a body scrub while the shower is running. The scrub will just melt away. A home body scrub once a week should keep your skin smooth. If your skin starts looking irritated, cut back on the frequency of scrubs or try something gentler than salt, like a sugar scrub or exfoliating mitt. Never use a body scrub on your face! It's way too harsh.